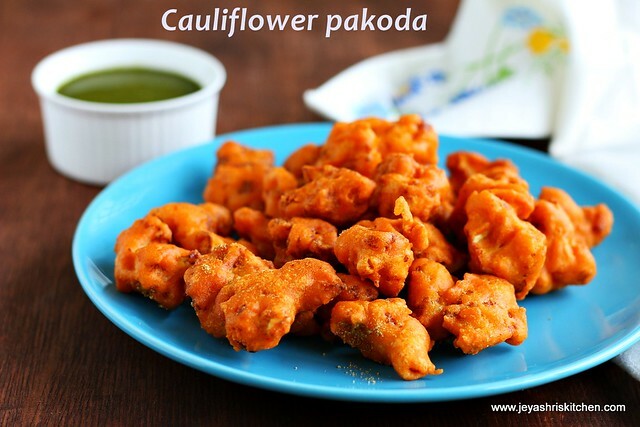 Cauliflower pakoda | Gobi pakora is a easy and tasty tea time snack made with cauliflower. I have already posted gobi 65, veg pakora recipe, but this one is more of South Indian style cauliflower pakoda. I just sprinkled little chaat masala in the last to enhance the flavour. You can serve this as a tea time snack or serve as an accompaniment for a southIindian meal. We used to have this cauliflower pakoda with curd rice too. 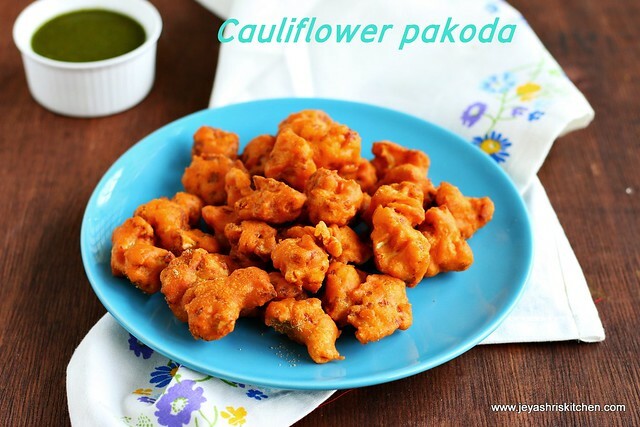 Try out this crunchy cauliflower pakora and let me know how it turned out. Wash the cauliflower florets and keep it aside. In a pan add water and add little salt. Bring it to a boil. Add the cauliflower florets to this and let this stay in hot water for a minute. Drain the water completely and keep it aside. In a bowl add the besan, rice flour, red chili powder, baking soda and salt. Add little water and make a thick paste out of this without any lumps. The consistency should be little thicker than an idli batter. Beat the mixture with a spoon nicely to get a nice airy batter. If you add more water by mistake add 1-2 tblsp of rice flour to bring it to the right consistency. Add the cauliflower florets to this and mix well and let all the florets get coated with the batter evenly. Heat the oil for deep frying. When it is hot, bring the oil to medium flame and put the cauliflower florets in oil and fry in batches. Let this cook and gets golden brown on the outer side. Once it is done take out from oil drain in kitchen towel. When it is hot sprinkle some chaat masala on this and serve hot. Adding chaat masala is optional, you can skip this too. You can add ginger garlic paste to the batter. Ajwain | omam can also be added to the batter. Ensure that the batter should not be too thin, else the batter will not get even coating and also will absorb oil. Keep the cauliflower florets ready and mix the batter just before frying. I made the mixture on one shot and kept one batch without frying inside the refrigerator and fried after 3 hours. It turned out pretty well. Do not fry in low flame. It will make the pakoras soggy. Finely chopped coriander leaves can be added to the batter to give a nice flavour. Enjoy the cauliflower pakoras | cauliflower pakodas with ginger tea or filter coffee. You are saying to coat the cauliflower and refrigerate and fry after that..